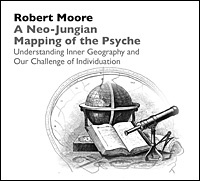 In this lecture Jungian analyst Robert Moore introduces his discoveries with respect to the actual deep structures of the Archetypal Self. Advancing the tradition of Jung’s study of the Collective Unconscious, Dr. Moore introduces a Neo-Jungian mapping of the psyche that he believes is a “decoding of the Diamond Body,” the Great Code of the psyche which is the foundation for the transcendent function and the role of the Self in balancing the opposites in our lives. After presenting this “map of inner geography,” Dr. Moore focuses on the implications of the organization of these deep structures for our psychological development and our spiritual growth toward wholeness. This program is part of the Bollingen Lecture Series presented by the C.G. Jung Association of Central Ohio. Robert Moore’s all-day companion seminar, Archetypes and Ecstasy: Archetypal Energies and the Quest for Optimal Experience, (RM51) may also be purchased at www.robertmoore-phd.com.